Conrad Cat's attempts to keep the battleship decks swabbed are frustrated by Daffy's tricks, like putting paint in his bucket, and by unexpected appearances of the pint-sized Admiral. An exceedingly mild-mannered man is sent out to kill a duck for dinner by his wife. Unfortunately for him, he picks Daffy Duck as his victim. The two face off and do battle for the remainder of the cartoon. Porky tries to relax on a hunting and fishing trip, but Daffy, smugly pointing out the "No Duck Hunting" signs, subjects him to constant irritation. Then the "Duck Hunting Season Open" signs start going up. Daffy takes on a goat sent by Hitler to eat up his scrap pile. Commando Daffy Duck goes behind enemy lines and causes havoc for a Nazi German officer and his troops. Hitler, Mussolini, and Hirohito are portrayed as ducks taking over a barnyard. Bugs is chased into a lake by a French Poodle who speaks with a thick French accent; the rest of the story unfolds under water. Bugs arrives in the desert to find Elmer prospecting for gold. Fudd is finally driven to pull his own gold tooth. Daffy Duck: Very sloppy, Roscoe. You're a slovenly housekeeper. Chuck Jones's 'Conrad the Sailor' is a totally lifeless cartoon starring the short-lived Conrad Cat character. Conrad is not much of a character at all, mainly memorable for being voiced by Pinto Colvig (instantly recognisable as the voice of Disney's Goofy). Here he is awkwardly paired with Daffy Duck for a painfully slow-moving chase aboard a ship. Conrad is a sailor (as the title suggests), swabbing the decks and singing happily until he comes across the muddy-footed Daffy whose antics instantly enrage him. Jones's take on this early, crazy version of Daffy was significantly more muted than those of Tex Avery and Bob Clampett and 'Conrad the Sailor' has a similarly draggy pace as Jones's previous Daffy film 'Daffy Duck and the Dinosaur'. The set-up is weak, the execution terrible and none of the jokes hit the mark. There's no sign of the spellbinding talent Jones would eventually prove to be in this cartoon. The ending is also completely feeble in that it's not really an ending at all. The time just seems to run out and the iris closes on the continuing chase. 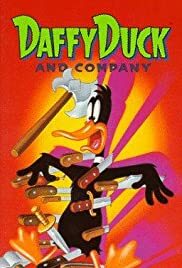 As a long term Daffy Duck fanatic, there are few cartoons that feature the little black genius that don't elicit some sort of positive reaction from me. 'Conrad the Sailor' is one of the exceptions and one of the few Warner cartoons that brings me not one iota of joy whatsoever.